Timings : Open 0930 - 1630 hrs. Located in the capital of Rajasthan, the City Palace of Jaipur or the main palace is an imposing blend of traditional Rajasthan and Mughal architecture. The vast palace complex occupies one seventh of the walled city of Jaipur. Originally built by Maharaja Jai Singh II of the Kachhwaha clan of Rajputs, additions have been made to the palace complex by many of his successors. The complex is divided into a series of courtyards, sprawling gardens and buildings. It is home to several palatial structures like the Chandra Mahal, Mubarak Mahal, Badal Mahal, Shri Govind Dev Temple and the City Palace Museum. In the first courtyard is the 'Mubarak Mahal', built by Maharaja Madho Singh II in the late 19th century. The Mubarak Mahal, or the Auspicious Palace, contains the textile section of the Maharaja Sawai Man Singh II Museum. There is a magnificent gateway with a grand door in brass opening to a stately courtyard. There lies the Diwan-I-Khas or 'Hall of Private Audience'- an open hall with a double row of columns with scalloped arches. On display are the two largest silver vessels in the world figured in the Guinness Book of World Records. These were used for carrying water from the holy Ganges for personal use, by Madho Singh II on his journey to England. Across the paved square, with its intricate decorations in deep red and gold, Afghan and Persian carpets, miniature paintings, astronomical manuscripts in Persian and Sanskrit lies the 'Diwan-E-Aam' or the 'Hall of Public Audience'. At the other corner is the gateway Ridhi Sidhi Pol, with four small doorways decorated with motifs depicting the four seasons. To the north-west is the graceful seven storeyed 'Chandra Mahal', or the Moon Palace, home to the present Maharaja of Jaipur; Bhavani Singh, providing a fine view of the gardens and the city. Paintings, floral decorations, mirror walls and ceilings in the traditional style adorn the palace. Each storey has a distinctive name and is a place of sheer beauty and luxury. The ground and first floor of the Chandra Mahal, form the Maharaja Sawai Man Singh II Museum. The museum has an extensive collection of art, carpets, enamelware and 15th century weapons. The paintings include miniatures of Rajasthani, Persian and Mughal schools. A section of museum also contains dresses and costumes of the former Maharajas and Maharanis of Jaipur. Sukh Nivas' or Hall of rest holds the drawing and dining room of the Maharaja, furnished with Mughal miniatures, European silver, glass dining tables and peep holes decorated with gold leafs, for ventilation. On the fourth floor of the 'Chandra Mahal' is the 'Shobha Nivas' or Hall of Beauty with mirror encrusted walls having exquisite blue tiled dadoes and glittering gold leaf and mica decoration. When the room was lit after dark the Maharajas could enjoy a breathtaking spectacle of the room bursting into a thousand flickering images. The Shobha Nivas and the Sukh Nivas is still occupied by the present Maharaja. The fifth floor is the 'Chhavi Nivas' or Hall of Images, the maharajas retreat in the rainy season, with a polished floor of eggshell stucco and blue and white painted walls. The sixth floor with its mirrored ceiling and stucco floor has rows of double columns through which one can have a magnificent view of the rugged hills. The uppermost storey is called the 'Mukut Mahal' or the Crown Building. 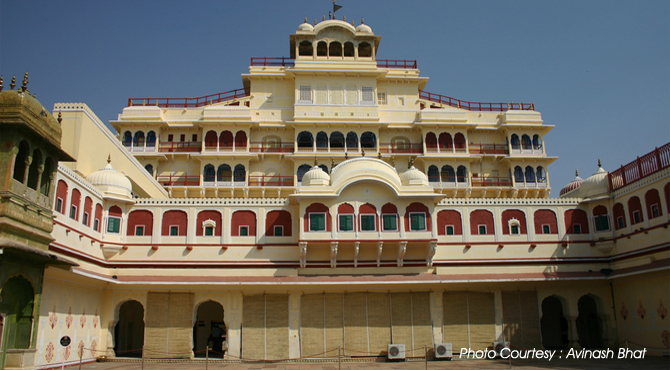 Opposite the Chandra Mahal lies the 'Badal Mahal'. The Govind Devji Temple stands in the middle of the Chandra Mahal and the Badal Mahal. A delightful system of fountains is placed in the middle of the paved path between the Chandra Mahal and the Badal Mahal. Another integral part of the palace complex is the Hawa Mahal of unusual architecture, standing away from the main complex. The king's bedchamber or 'Palliyara' left of the entrance occupying the southwest corner of the Palace is noteworthy with its low wooden ceiling and 300 sq feet of wall surface covered in about 48 paintings illustrating the Ramayana, from the beginning of the sacrifice of Dasaratha to Sita's return from captivity in Lanka. These paintings are the earliest in the palace, dating as early as 16th century. The last five scenes are from the 'Krishna Lila' where in a cheerful God Krishna using his six hands and two feet to engage in foreplay with eight happy milkmaids. Another important series of paintings in the Dutch Palace is found in the upper staircase rooms, notably that of the coronation hall that was made under Dutch patronage. Among the compositions are Lakshmi seated on the lotus, sleeping Vishnu (Ananthasayanamurti), Shiva and Parvati seated with Ardhanariswara and other goddesses, the coronation of Rama, Krishna lifting Mount Govardhana etc. On the opposite side of the coronation hall is the staircase room or Kovinithalam (Room No II) , with a descent to the lower storey and four paintings belonging to Shiva, Vishnu and Devi, one incomplete. The ladies chambers below the stairway are closed off to visitors. Room No. IV depict scenes from Kumarasambhavam and other works of the great Sanskrit poet Kalidasa. The eastern rectangular chambers across the rosewood covered main hall is entered through a steep stairway and an entrance porch with finely carved and painted ceiling. The first of the eastern chambers is marked by fabulous scenes of Vishnu and Siva iconography and just beyond it to the left is a small room with an unfinished but bold image of Vishnu as 'Vaikunthanatha'. These are among the latest works in the palace. The Dining Hall has carved wooden ornate ceiling decorated with a series of brass cups. The palace also contains rare examples of traditional Kerala flooring, which looks like polished black marble but is actually a mixture of burned coconut shells, charcoal, lime, plant juices and egg whites. Adjacent to the palace, almost within its grounds is the famous Cochin synagogue built in 1567 and between them stands a large circular temple with a cone roof which is not open to non- Hindus.